Wednesday, January 6, 2016 – Tie Me Kangaroo Down, Sport! Wednesday, January 6, 2016 – Tie Me Kangaroo Down, Sport! Or Some Puzzling Questions. A most valued reader of Here’s What I’m Thinking left a football puzzle as a comment the other day. Thank you, Reader Reggie for reading and the comment. I do not know the answers so I am offering the puzzlers to others today. I can think of many D-I college football coaches that are considered donkeys, but I am going have to jump around online to research coaching kangaroos. And now, jumping to our puzzle. A Div 1 bowl team is blessed with a kangaroo for a head coach. Can you name the coach & team ? # 1: Too bad it is not Kliff Kingsbury from Tortilla Tech. It would make such great alliteration. # 2: Dear Coach Kingsbury, I know you love your alma mater, and you are cranking it up a notch, but just in case you have not heard, the Offensive Coordinator position is open at Texas A&M. 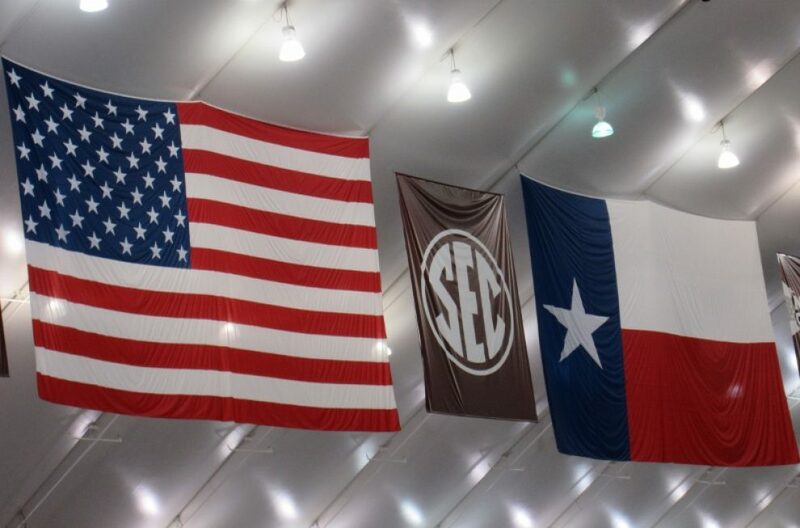 # 3: One QB has already selected the Texas Aggies and with high school signing day now less than a month I am sure others will select the Harvard on the Brazos as their choice. Meanwhile – SEC! SEC! SEC! ROLL TIDE! Old Main? – Sam Houston State University once had a building called Old Main. I shall seek intellectual guidance and stimulation at the local Academic Salon where all Aggies go to think deep thoughts. If you can solve the puzzle, please contact Reader Reggie for your prize. I think it is a stuffed kangaroo. Before we look at Saturday’s college football schedule, I want to give a shout out to PT (as in personal trainer, not physical therapist) Killer Queen (KQ). I am keying this post one letter at a time with a pencil between my teeth. This is the only part of my body that does not hurt. Seems KQ wanted to try a new exercise routine yesterday that she found on Pinterest. Meagan, stop showing her this crap. It began with 15 push-ups. There were 30 jumping jacks – followed by 50 more. I lost consciousness sometime during the burpees and I think only 15 minutes had elapsed. I am still grinning today though. I did all of the exercises, lived to tell about them and have KQ to witness. Nice job, KQ. But we must look forward to the really big football games tomorrow. Remember I write about football teams I like and teams that play teams that I like. If your team(s) is not mentioned, please let me know and I will be happy to make snarky comments about them. The Selection Committee has spoken for the first rankings. I told you we (mostly me and RL) suspected a secret meeting between The Committee and The Pope to ensure Notre Dame over Baylor. THE University of Texas with a 4-5 record and West Virginia at 4-4 meet on ESPU coming live from Morgantown, West Virginia. Remember: When WVa wins, the students burn couches to celebrate the victory. Like I know why? I am not up on hillbilly culture and customs. Nevertheless, Horns, please protect the environment and do not allow couches to be set on fire. Coming live from Jones AT&T Stadium in Looobock, Texas the Tortilla Throwing Red Raiders of Texas Tech host the Wildcats from Kansas State. The interest level is only due to bowl match-up projections. It can be viewed on Fox Sports Network. On ESPN2 @ 2:30 we have # 1 and undefeated Clemson @ 9-0 visiting Otto the Orange and Syracuse in Syracuse, New York. The team wearing orange will win. Opposite at 2:30 with the worthless, Chatty Cathy CBS announcers, rolling in at #2, with a record of 8-1, The Crimson Tide of Alabama rolls into Starkville, Mississippi to meet Mississippi State. Remember, Tigers, it is the SEC and on any given day something unexpected can happen. From “… where the winds come sweeping down the plains,” the # 8 Oklahoma State Cowboys at 9-0 travel to Ames Iowa to meet Iowa State with a record of 3-6 @ 2:30. Pistol Pete and the Cowboys are used to Cyclones. The game is on ESPN. On the Notre Dame network, NBS, the Creepy Leperachauns of #4 Notre Dame with a record of 8 and 1 play the powerful Demons of Wake Forest with their record of 3-6. Should we call this the Exorcist Bowl? Cousin Darryl and the Demons of Northwestern will be at Bowers Stadium in Huntsville, Texas meeting Sam Houston State. Yes, I have a degree from Sam Houston, but Me and Cuz Darryl are DNA related, so Go Demons. When night falls a most interesting contest between #24 Houston @ 9-0 and # 21 Memphis @ 8-1 @ 6 kicks off on ESPN2 from TDECU Stadium in Houston. Where did you two come from? The Razorbacks from Arkansas and the #9 LSU meet on ESPN at 6:15 from Tiger Stadium in Baton Rouge. I will have a cup of gumbo with a big side of bacon please. And in the game with the most ramifications for the Big 12 Conference and the national rankings we find #6 Baylor versus #12 Oklahoma on ABC from the truly beautiful McLane Stadium in Waco at 7:00. The Home Depot Game Day Show should be setting up for tomorrow’s Big 12 showdown about right now I hope Corsor looks good with a Bear on his head. Does anybody really look good with a Sooner Wagon on their head? My main screen will be when West Carolina University comes to the magnificent Kyle Field to take on the Texas Aggies @ 6:00 on the SECN. Does that meet Bret Mushmouth and Jesse Palmer are the announcers? Get me to a radio. Bret – the term is AGGIES, not Eggies as you continually say. Put down your cocktail. The Aggies who appear to be having a Ground Hog Day movie kind of season take on the West Carolina Catamounts form Cullowhee, North Carolina. OMG – I hear banjo music playing. Both teams are 6 and 3. The mascot of West Carolina is a Catamount. Is this some kind of sailing vessel? Where is Cullowhee, North Carolina? A Catamount is a cat – really big one with teeth. I believe in Texas it is referred to a mountain lion or a cougar. Cullowhee, North Carolina sits among The Great Smokey Mountains and Blue Ridge Mountains. Sounds beautiful.